When you mention the health care field, the first jobs that usually come up are doctors, dentists, nurses and pharmacists. It is understandable that someone would mention these occupations because those are the people who the patients come in contact with the most. However, in order for any health care system to work, there must be a team working in the background to fill in the gaps. Those who have allied health degrees assist doctors, dentists, nurses and pharmacists in their tasks and handle a lot of the paperwork. They are also there to prep the patient before the physicians come in to examine. Examples of jobs or careers you can get with allied health degrees are dental hygienists, massage therapists, medical coder, medical assistants, EMT, pharmacy technician and phlebotomists. These are only a few occupations that scratch the surface of this broad degree. As you can see, without allied health workers, the whole health care system would fall apart. Education required can vary with the type of occupation, such as on the job training, but most require a degree. These jobs are the foundation that help you advance up the ladder of the health care field. If you needed a starting point, this would be it. There are great websites to help you search for schools in your local area and read up more about these degrees. There are search tools filled with listings on every page and helpful articles detailing the process and opportunities available for someone like you. You can also read up on the growth of this industry while learning how to pick the right school to fit your lifestyle. Whether you have five kids, are unemployed, looking for a new career or trying to get into the healthcare field, this is the place to start. In this economy, it is not uncommon for people, in all sorts of fields, to start searching for alternative jobs where their previous skills can still be fully utilized. Caregivers are no exception. Many caregivers today find themselves moving from the traditional caregiver assignment of assisting the elderly to related jobs like working with autistic children and nursing. Fortunately, many alternative jobs for caregivers require little to no additional training and can even lead to better benefits. The career of a traveling caregiver is quickly becoming a popular and rewarding job for thousands of skilled workers in the United States. Traveling caregivers require no more education or training than a typical caregiver, although they’ll be required to travel around the country frequently. This career generally requires the caregiver to move from job to job, staying anywhere from a month to a year with each client, depending on their needs. Room and board is often paid by the agency and you can earn anywhere from $8 to $15 an hour, depending on your qualifications and experience. This can be a well paying job depending on the client who is hiring you to become a personal shopper. Your duties involve listening to the elderly person and taking proper notes for the items they request or the items that their family request. This can become quite the treasure hunt if you have a client with specific needs. Your caregiving skills will come into play when you listen patiently and address all their special needs. If you have been around people who constantly need reassurance and encouraging words to help them take their medicine or get them through the day, then a job of a motivational speaker might be in your future. These caregiver skills of listening and speaking positive words can be transferable to this career. Nursing aide is another great alternative job for caregivers, although there will be a need for additional training. To switch careers from a personal caregiver assistant to a nursing aide, you will need at least a high school diploma and possibly training and a license, depending on your state. You must also complete a 75-hour certification process to become a CNA (Certified Nursing Assistant) and pass an evaluation to work in a nursing home facility. Nursing aids are compensated well and earn between $10 and $15 an hour. Lastly, child care is yet another common alternative job for caregivers and often requires no additional training, although you may want to get certified if you want to work with autistic and special needs children. Paraprofessionals work as assistants to these children helping them perform their daily activities and uses applied behavioral analysis (ABA) techniques to help improve their behaviors. Depending on your state, you may be required to get credentials as a Child Development Associate (CDA). Providing child care in your home will also require a license in most states. Child care workers are typically paid somewhat low rates of $9 to $11 per hour, although higher education will mean better opportunities. This career field is also excellent if you don’t want to travel because you can run an entire business from your home setting. Find a caregiver job that will meet your experience and expectations. Use the form below with your caregiver resume in hand for reference. Make sure you have your desired salary amounts in mind before you begin the search. As of 2010, the average caregiver jobs salary is $28000. Average caregiver salaries can range from 22,000 to 33,000 depending on where you work, the location, which industry it’s in and your own experience and benefits needed. Who are you willing and experienced to take care of? After sending in a caregiver resume to your future employer, they will usually require follow up information regarding your salary and past employment. There are a few things you will need to do before sending in this cover letter. Make sure you are ready for a call requesting an interview and do some research on your desired salary. In addition, refresh your memory on past job responsibilities and duties. Your future employer will very likely ask you to discuss roles you might have had that will be useful for the new job position. Past behavior and performance is an excellent indicator of future performance and behavior. 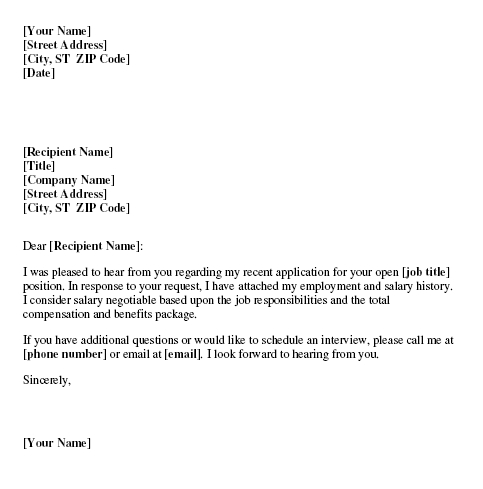 Here is a sample follow up letter you can use as a template for your own caregiver cover letter.